Those who live on the coast line of North or Central America know about and most likely have endured the winds and rains of tropical storms and hurricanes. Today we have radar to warn us days in advance with all types of “spaghetti” drawings for possible paths. Planes fly into the eyes and can give us information as to wind speed and size. 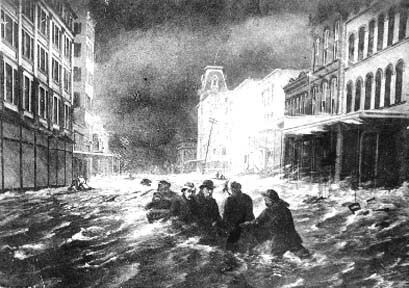 Such was not the case on the Texas coast in September of 1900. One hundred and fifteen years ago this past September 8, the most devastating storm in history battered the town of Galveston and claimed thousands of lives. They had little warning and no defense for the winds and rains that would descend on the town and sweep in from the Gulf of Mexico. On September 8, 1900, 38,000 people resided in Galveston, a bustling busy seaport with its natural harbor of Galveston Bay. At the time it was the biggest city in the state. A proposition to build a seawall for protection was submitted, but it was dismissed by the majority of the population and the city government as too costly. On that morning, the people of Galveston were completely unaware that this day would be the last day for their town as they knew it and the last for so many of their friends and loved ones. 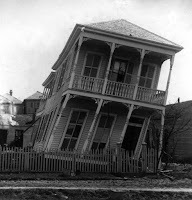 Although the skies did give some warning that a storm approached, the citizens of Galveston had weathered storms before and were not worried. That morning the high tides flooded some inland streets, but still the residents didn’t think that unusual as they were almost at sea level. At mid-morning the rains took over and the winds began whipping the trees. By mid-afternoon, the storm hit with such force and intensity that darkness descended over the city. Classified by today’s standards, the storm would be a Category 4 with winds of 145 miles per hour. The winds blew and the rains came steadily until the next day when the storm finally made it’s exit early in the morning of September 9. What was left behind was total devastation with bodies littering the landscape strewn with debris resembling matchsticks carelessly tossed about. 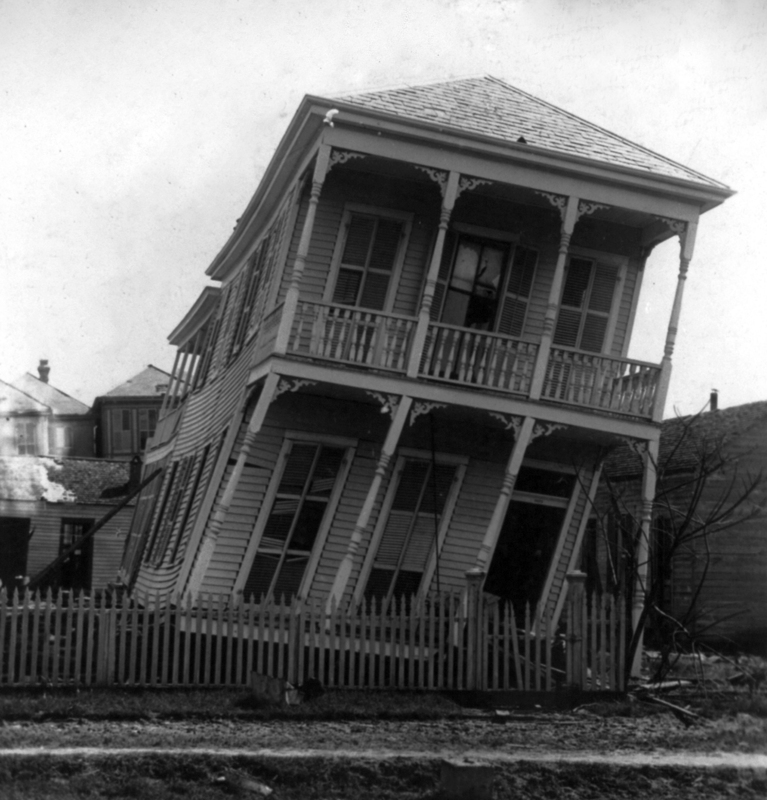 Houses that had withstood hurricanes in the past burst apart or were torn from their foundations as were business establishments. 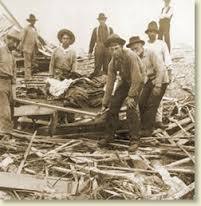 That hurricane is the third deadliest in US history for the Atlantic side of the nation topped only by the Great Hurricane of 1780 and the 1998’s Hurricane Mitch. 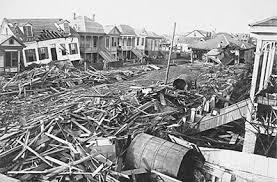 With 8,000 official deaths and upwards to 12,000 estimated by some, the town of Galveston was all but wiped from the face of the Texas coast as 30,000 were left homeless. St. Mary's Hospital took in as many injured survivors as they could, but they were soon overwhelmed. Removing the dead took several days and with so many bodies recovered, the town ended up burning them because of the stench and lack of facilities to handle that many bodies. As residents began picking through rubble for any signs of their former life, they began to realize that the town they had known and loved had been all but completely destroyed. Not to be defeated, the town rebounded and began rebuilding, but it never regained the status as seaport that it once had. One of the most heart-breaking stories is that of the orphanage. Among the dead were 10 sisters and 90 children from the St. Mary's Orphans Asylum, operated by the Sisters of Charity. Next month I will tell their story. 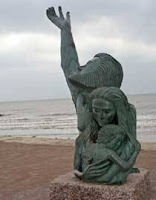 Today a memorial designed by David Moore stands at 4800 Seawall Blvd. as reminder of all the lives lost on that day in 1900. Have you ever been through a storm like a hurricane or tornado? If so, briefly describe your experience. 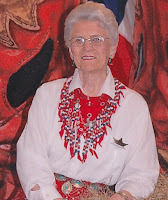 Martha, In 2004, we had three strong hurricanes hit us here in Central Florida. That was quite an experience, but because my husband and I lived in an apartment building, all we lost was my old car when a tree fell on it in the parking lot. Some people lost much more. During the worst one, Charlie, we did have power outage for several days, but we had learned to be prepared with food and water, so we didn't go hungry. I will say that after the skies... and the streets... cleared, I had a hankering for comfort food, so we headed to Cracker Barrel and some chicken and dumplings. I remember those, Louise. So glad you all weren't greatly impacted. When Ike hit here, we lost part of our fence and a lot of tree limbs, but across the street two houses had major damage from trees falling on them. We have 17 trees in our yard, so we were so fortunate none of them fell. I laughed at your Cracker Barrel meal because that's exactly what my husband would have ordered. We were without electricity for 4 1/2 days, so we would have loved to have had a Cracker Barrel close by. We had plenty of water and grilled a lot of food from the freezer. I watched a documentary a few years ago on this storm, Martha. Heartbreaking. 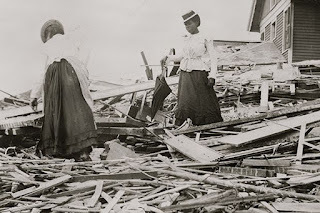 The damage from Ike was devastating but nothing like what those people endured. Our house, too, was spared serious damage from Ike. Fence and a few trees but the roof stood the test. We were without power for 16 days so that was the most difficult part.